Most meat eaters love burgers, as we do. Most meat lovers might think that you couldn’t possibly be satisfied with a Black Bean burger even as my husband thought before making them for the first time. Add a little spice and they can be as satisfying as the real deal. They’re a great way to cut down on red meat if that’s what you want to do or maybe asked to by a loved one or a physician. Your stomach will sure as heck be satisfied with this alternative burger since it’s full of fiber from the black beans and protein from the chickpeas. You might ask yourself, why chickpeas? Why not? We strayed from the usual black bean burger only to add more healthy filling goodness; experimenting one day by adding the chickpeas and cilantro we liked it! 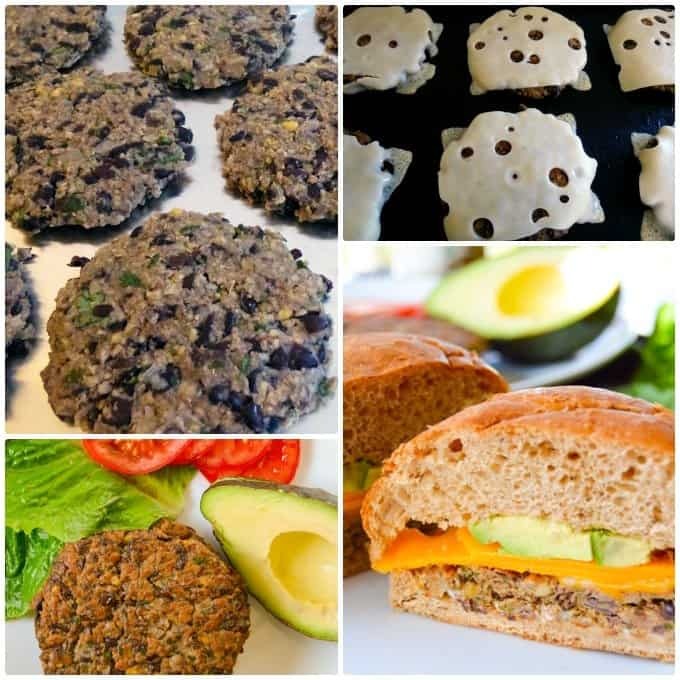 Why not Store Bought Black Bean Burgers? Most store bought black bean burgers just as many other prepackaged foods contain tons of fillers, way too much sodium and/or preservatives. I’m sure there are some that are fairly healthy, but unless you truly inspect the labels and there aren’t more than 5 or 6 ingredients (not including spices), you’re probably better off making these yourself. Also, making these yourself is way cheaper than store bought, I guarantee it. To make this batch of 10 burgers (not including buns) it costs less than $5! Seriously, it’s a steal for healthy filling burgers and if you make this whole batch and just feed a few people to start, freeze the rest and then you’ll have another 1 or 2 meals for later. Making these is easier and faster than you might expect if you’ve never made homemade ones. You can also easily half this recipe and just make 5. As I stated earlier, I make this big batch only because it’s just as easy to make the big batch and freeze the leftovers. We like to use our electric griddle to make these because we can cook 6 at at time, but you can cook them just the same on a skillet. I like the even cooking and efficiency of the griddle. If you’re not a fan of chickpeas you can easily just make these with all black beans or substitute for another bean. Also, use whatever cheese you like, we’ve enjoyed them with sharp cheddar and swiss. If you follow a gluten-free diet these can be enjoyed on a gluten-free bun or a big lettuce leaf with avocado and tomato. Without cheese these are great piled with just avocado and a condiment of your choice. Try our sriracha sauce or straight Sriracha with them if you like as well, so good! When we first made black bean burgers for our kids we didn’t want them to judge them before trying them so when they asked us what they were we quickly called them “Delish Burgers.” Then once our oldest boy had his first bite he renamed them to “Yum Burgers.” So now that’s what they’re called in our house, Yum Burgers. There’s no harm in not giving your kids the full story when it comes to health if you’re trying to get them to try new things like different food than what they’re used to. You can of course dress these up with their favorite toppings and just put it in front of them and let them discover it on their own. Give these burgers a try along with my roasted red potatoes and be sure to comment below. Enjoy! 1/2 cup bread crumbs (we prefer panko) *If you need these to be gluten free, they do stay together quite well even without the panko. Drain garbanzo beans and black beans separately (starting with garbanzo because you will mash these 1st), but do not rinse beans. Let drain in colander for at least 5 minutes. Meanwhile saute diced onion on medium heat, about 6 mins. in about 1/2 Tbsp olive oil or butter until tender and starting to brown. Remove from pan and let cool. Mash garbanzo beans in a small bowl with potato masher or fork til mostly mashed. Now mash black beans in medium mixing bowl you will make your burger mix in. Leave some black beans whole, so do not over mash. Add onion, breadcrumbs, garbanzo beans, eggs and spices through cilantro to bean bowl. Stir mixture and let rest 5 minutes. Scoop 1/3 cup of mixture and form a patty with hands about 1/2 " thick. Repeat till mixture gone. Heat butter or oil on griddle or skillet at medium heat. Once ready cook patties about 5 minutes on first side (or until browned and solid to flip), flip patties carefully and add cheese slice if desired and cook another 5 minutes or heated through and cheese melted. Grill your buns with a little butter or oil on undersides for a minute or two once patties all cooked. Top your burgers with your favorite condiments, like our sriracha sauce and enjoy! br]We usually serve with salad or [oven roasted potatoes. Thanks for sharing this recipe! Made them today and I was very pleased. My skeptical husband even went back for seconds! Awesome, Lori. I love to hear that! Thanks for trying it out. Thanks for posting this recipe! I made it without cilantro (was out and too hungry to wait). I also used Flaxmill in place of the bread crumbs to make them gluten free. They were still a little hard to form this way (prob didnt help that i used my food processor instead of mashing them) so I scooped out the mixture onto a pan lined with parchment paper and the pressed them down into a pattie with an oiled spatula. I baked them for 10 minutes on each side at 375 and they turned out great! Awesome, Jess! Glad you were able to substitute to fit your needs and still enjoy them. Do try them with cilantro next time if you can, it gives them a great fresh flavor. These are FANTASTIC and I ALWAYS do them in the oven - somehow they taste better this way!!! GREAT recipe!! So glad you enjoyed this recipe, Amber! I really appreciate the comment and what works for you. Thanks for sharing! These were amazing!!! This is going to be my new go to for something so easy and delicious. I'm not very skilled at cooking and I was so pleased to find this recipe and have it come out so yummy. I'm already having seconds! That's great, Julie! So happy to hear from people like you. I appreciate the feedback. Enjoy and please keep checking us out! I was really excited to make this recipe, but it was a disaster. They completely fell apart on the frying pan and turned into mush. I am really disappointing and I'm an experienced cook. Added everything like it states, eggs and breadcrumbs and all. I don't understand and disappointing and the wasted ingredients. Julia, I'm very sorry they did not work out for you. I really am not sure why they turned out that way. I have made this recipe numerous times and have not had that happen. I actually follow my own recipes from the site as I make a dish (to check for discrepancies). All I can say is that I use a griddle to make these with even heat and do wait for them to form almost a crust on the 1st side before I flip them and I flip them gently as stated in the recipe as they are still more delicate compared to other bergers. I understand your frustration and also hate wasted ingredients. Maybe make the burgers and put them in the fridge for a few hours before cooking them or add oat flour to the mixture. Yes, Jack. You could absolutely chill them in the refrigerator for a bit before cooking them. I've just never had a problem with them cooking well without chilling beforehand. Thanks for the comment! Can you freeze these before cooking? Absolutely Natalia. Freezing them would work great and just be sure to thaw them overnight in the refrigerator before cooking. Enjoy! These burgers were easy to make, granted I made all the beans from scratch. I might up the seasoning just a bit - once you add lettuce, cheese, and tomato the bean taste gets a little lost. First time making bean burgers! Thanks for your feedback, Chelsea! Always appreciate it.